To those of us fighting to save our rivers around the province from the Campbell private power program, the recent revelation of the cancelation of a billion-dollar-plus purchase contract with BC Hydro was big news. But you wouldn't know it from the mainstream media. In fact, a google search yields barely a trace - save for the independent Kootenay online paper, the Nelson Post, who reported on it this past Friday. The 40-year energy purchase agreement for a proposed 5-river diversion project, near the town of Meadow Creek, was obtained back in 2006 by Axor Group, of the wealthy Dupont family, long before the environmental assessment process that would see thousands of citizens turn out in opposition to the proposal and a record-breaking thousand-plus submissions to the environmental assessment office. It appears this outpouring of protest helped delay the project to the point where Axor was about to begin incurring substantial penalties for not having the project completed as per their contractual commitment. Based on statements made by the company today, it appears they have been let out of their contract in advance of these penalties and are now looking to renegotiate a better deal with BC Hydro! Back in 2009, when Axor Group (who we saw were really in charge of the provincial environmental review, not their sycophantic government attachés) refused to schedule a meeting in Nelson, the unofficial capital of the region, community organizers got school buses and carpooling together to transport concerned citizens to a meeting in Kaslo (pop. 1,000). When over 1,100 people showed up at that meeting to speak out against the proposal - on top of hundreds more who attended other scheduled meetings - it was clear then that the Glacier-Howser project was in serious trouble. The mountain of written submissions also included damning evidence of rare bull trout populations that would be gravely threatened by the project - highlighted by a joint submission from DFO and local First Nations, of all people. 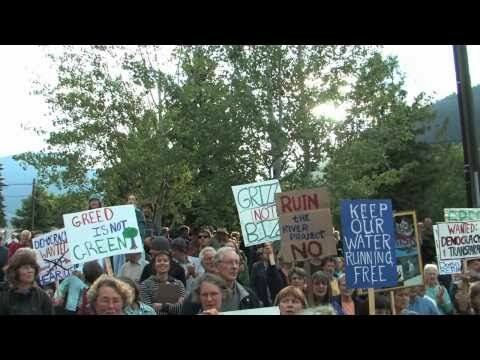 Now, in recognition of the public uprising that was surely instrumental in the cancelation of this original contract, we're pleased to present again my film from the summer of 2009 on those fabled public meetings that saw a record turn-out of citizens standing up for their wild rivers. Postscript: In light of new information yesterday from the Nelson Post that shows the proponent is looking to resurrect the project with a new and better contract, citizens and environmental groups would do well to stand on guard and be prepared to take to the streets should Axor be able to proceed with a new deal from our public utility, clearly against the public will and benefit.